The demand for biodegradable plastic film is expected to climb 5.4 per cent yearly to $122 million in 2023. Food packaging will remain the dominant market for biodegradable films and is expected to account for 62 per cent of demand in 2023. Biodegradable films will increasingly be employed in the production of salad, produce, and other food bags, as well as in labels. Additionally, biodegradable plastics usage in overwrap and other films – including those used as twist wrap, cut and wrap, twist film overwrap, and candy wrappers – will continue to make inroads vis-à-vis conventional films. PLA is currently the leading product in the packaging film market, and is expected to offer some of the best opportunities for growth through 2023, benefiting from favourable properties, such as high clarity, twist retention, printability, strength, and flavour and aroma barriers. These and other trends are presented in Specialty Films, a new study from The Freedonia Group, a Cleveland-based industry research firm. The demand for biodegradable bags is also expected to rise rapidly through 2023. Advances will be driven by an expanding composting infrastructure and governmental efforts to reduce landfilling, which will boost demand for compostable bags used in the collection of food scraps and other organic materials for waste diversion programmes. Overall advances will be restrained to some degree by the inability to substantially widen the national scope of composting networks, as well as competition from kraft paper bags. 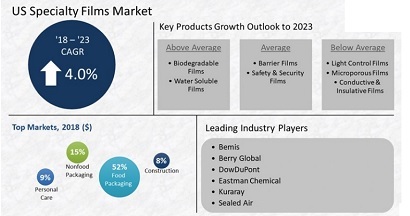 The demand for all types of specialty films (barrier, microporous, safety and security, conductive and insulative, light control, water-soluble, biodegradable and other) is forecast to advance four per cent annually to $9 billion in 2023. The fastest gains will be in the biodegradable and water soluble film segments, the result of rapid growth in markets, such as degradable packaging for food and non-food items, such as laundry detergent pods and oral drug delivery strips. Other smaller volume functions, which include tapes and release films, will also see above-average gains in demand through 2023.